Poster. 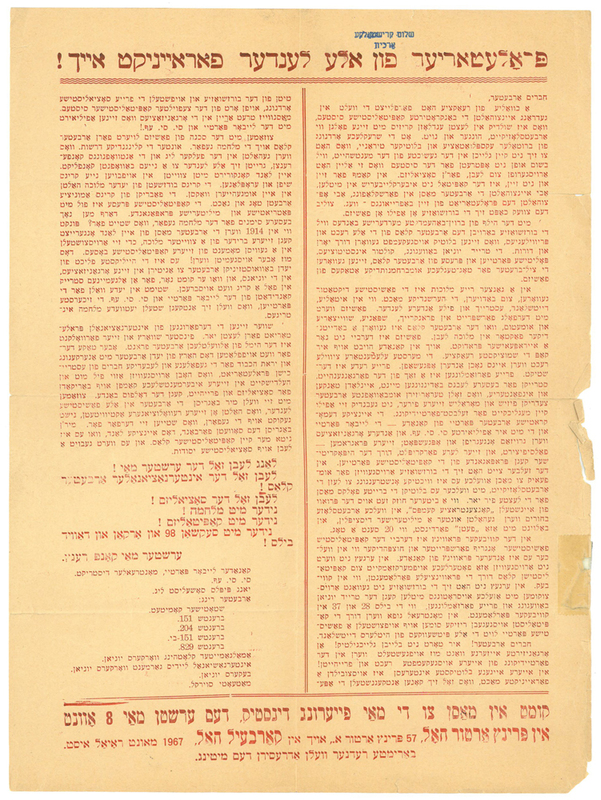 "Great Protest Meeting Against New Wave of Soviet Antisemitism also Twentieth Anniversary of the Murder in Soviet Russia of Henryk Erlich and Victor Alter". 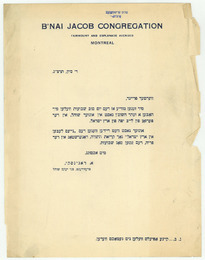 Text includes: Plateau Hall / 3710 Calixa Lavallee (LaFontaine Park) / Sunday, December 17th 1961, 8 P.M. / Great Protest Meeting Against New Wave of Soviet Antisemitism also Twentieth Anniversary of the murder in Soviet Russia of Henryk Erlich and Victor Alter, Leaders of the Jewish Socialist Movement ("Bund") in Poland / Speakers: Hon. 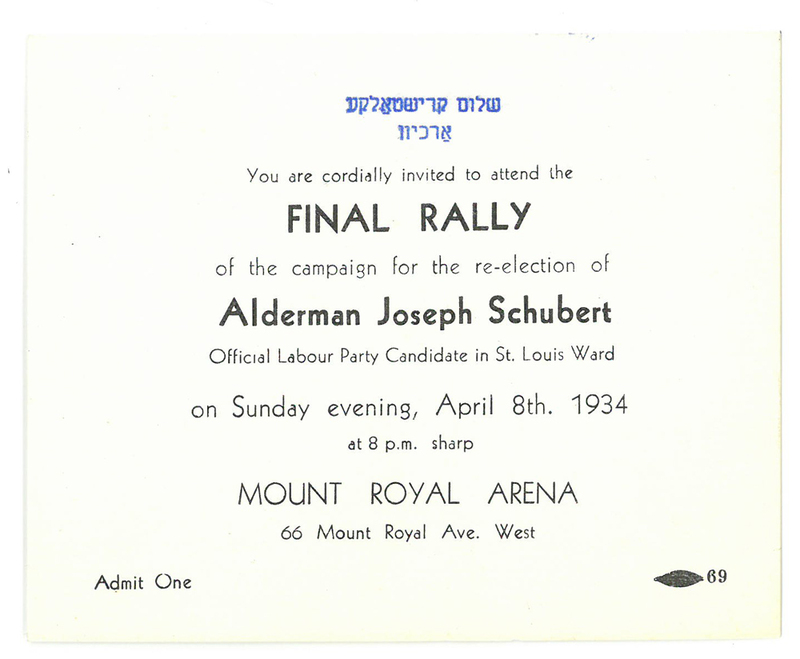 Tommy Douglas, Federal leader of the New Democratic Party / Dr. Emanuel Sherer, "Bund" New York / Roger Provost, President, Quebec Federation of Labour / Prof. Arthur Lermer, Chairman, Workmen's Circle, City Committee / Chairman of Meeting: M. Rubinstein, Q.C., National President, Jewish Labour Committee (1961). Flyer. 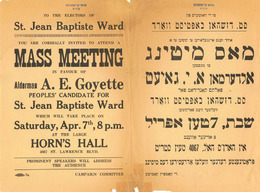 "Every Jewish voter is invited to mass-meeting". 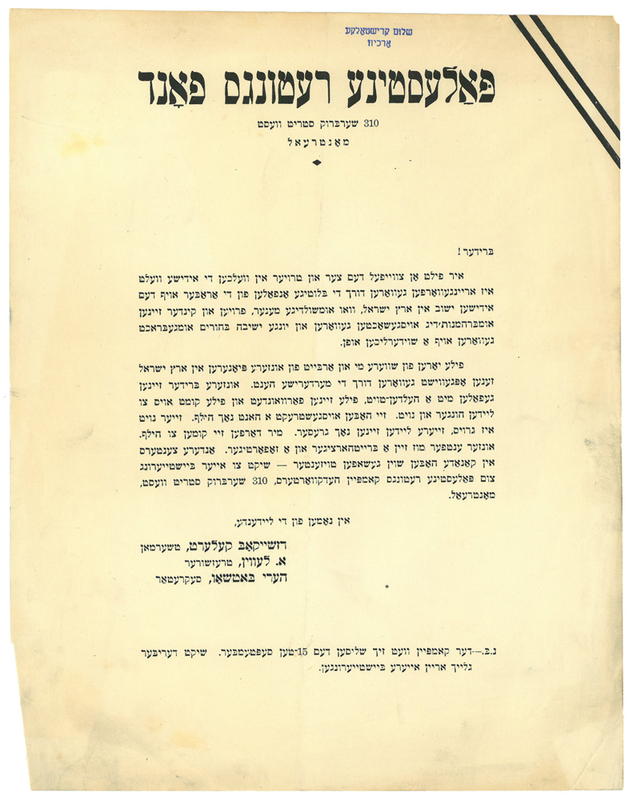 Includes the following text: Every Jewish voter is invited to attend a mass- meeting to be held on Sun. 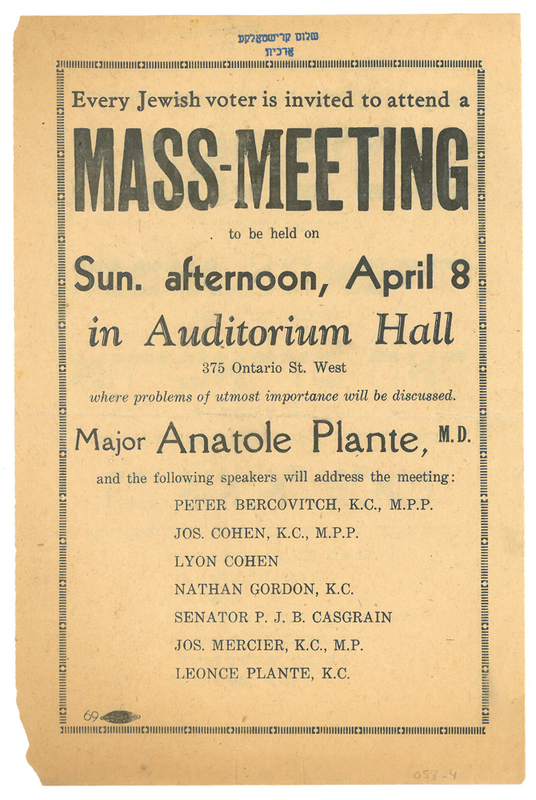 afternoon, April 8 in Auditorium Hall 375 Ontario St. West where problems of utmost importance will be discussed / Major Anatole Plante, M.D. and the following speakers will address the meeting: Peter Bercovitch, K.C., M.P.P. / Jos. Cohen, K.C., M.P.P. / Lyon Cohen / Nathan Gordon, K.C. / Senator P.J.B. Casgrain / Jos. Mercier, K.C., M.P. / Leonce Plante, K.C. 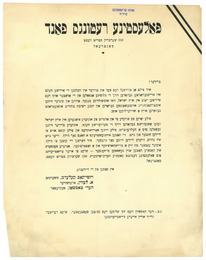 (1934). Press release. 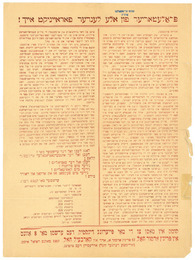 Campaign for Palestine Rescue Fund (between 1930 and 1947). Press release. 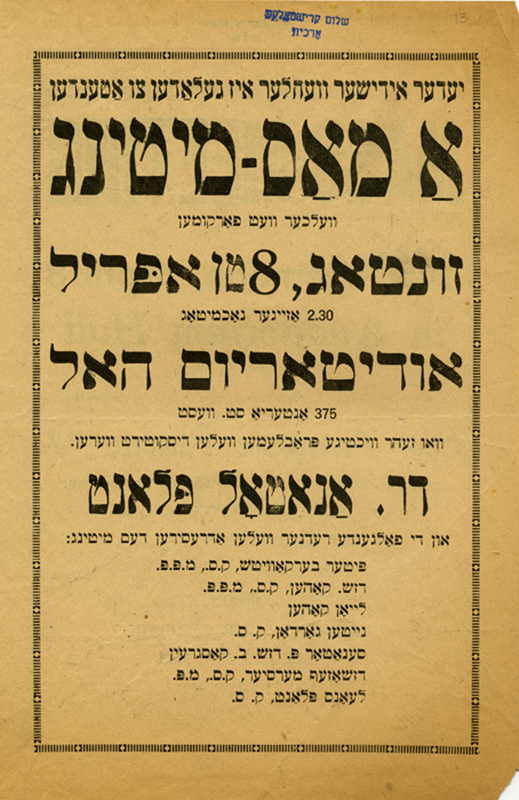 B'nai Jacob Congregation announcing event, "The New Life in Israel" with speaker Leib Jaffee from Palestine, May 29th 1933. Poster. Canvasser's gathering, Canadian Zionist Organization. 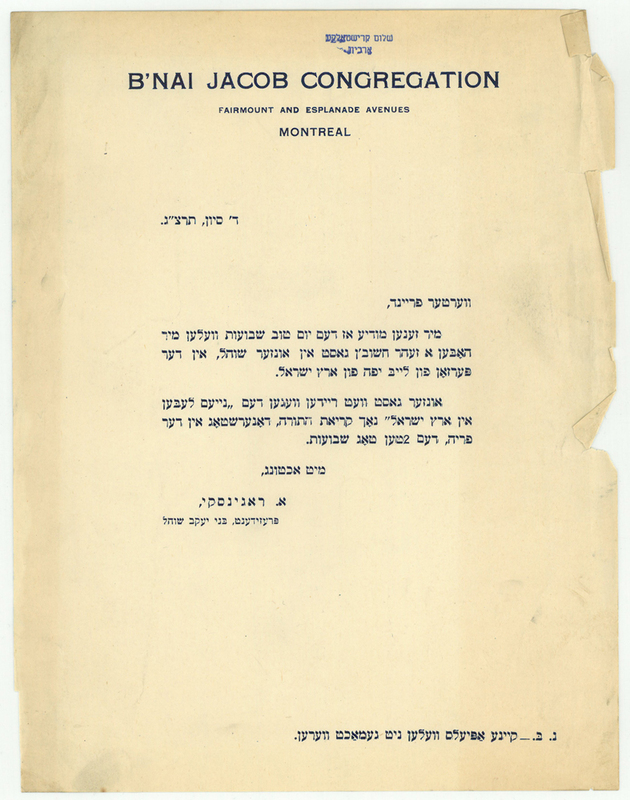 Text translated from Yiddish: Canadian Zionist Organization / Thusday April 16, 1931 8:30 pm / Canvasser's Gathering / Mount Royal Hotel / Joined by - James Waterman Weiss / Campaign - April 21-30 1931. 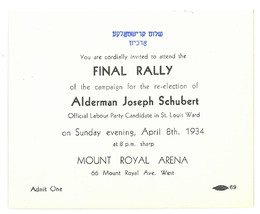 Invitation card, Alderman Joseph Schubert final rally for 1934 campaign (1934). 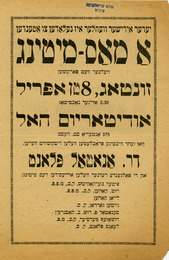 Flyer. 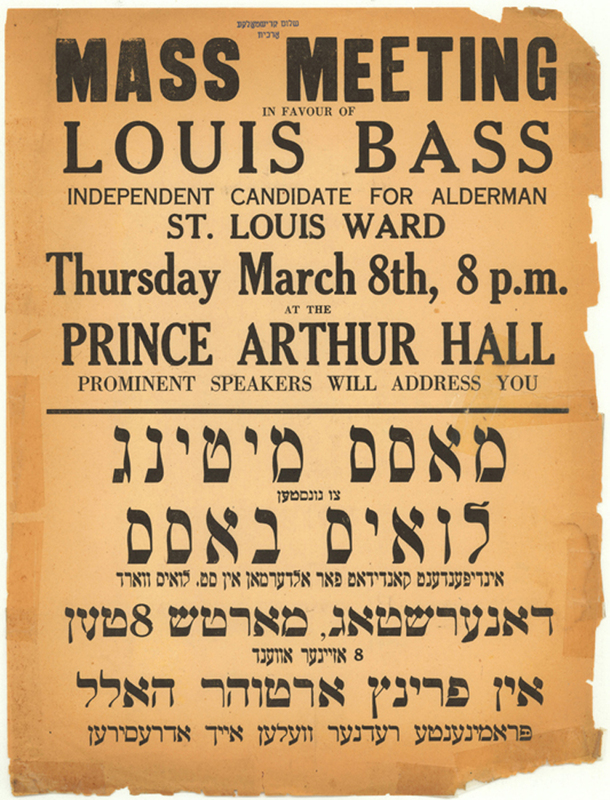 Campaign in favour of Louis Bass, St. Louis Ward (between 1930 and 1950). 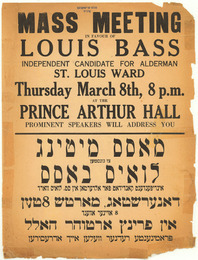 Flyer. 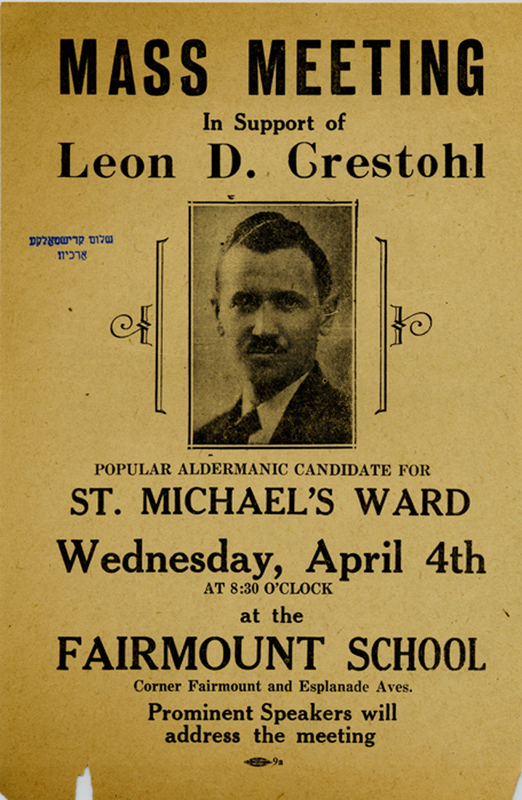 Campaign for A.E. 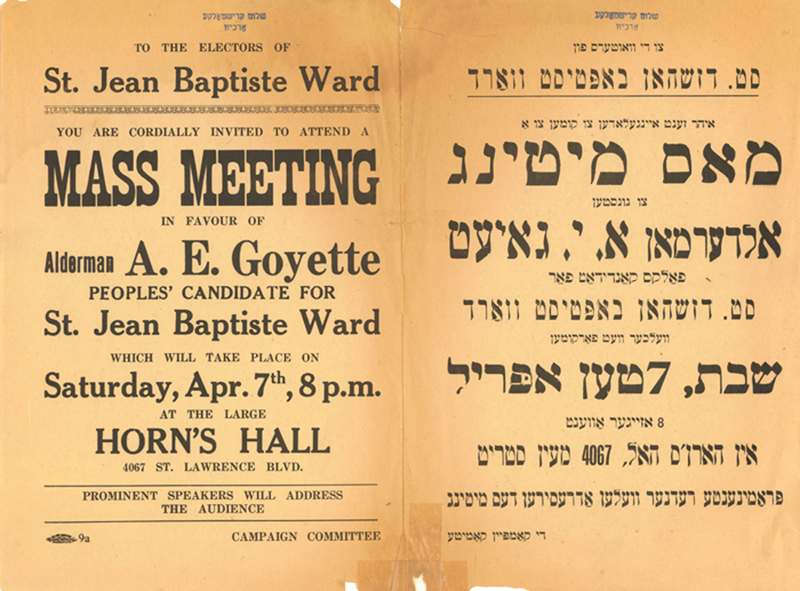 Goyette, St. Baptiste Ward (between 1930 and 1950). 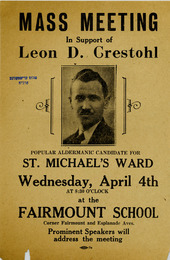 Flyer. 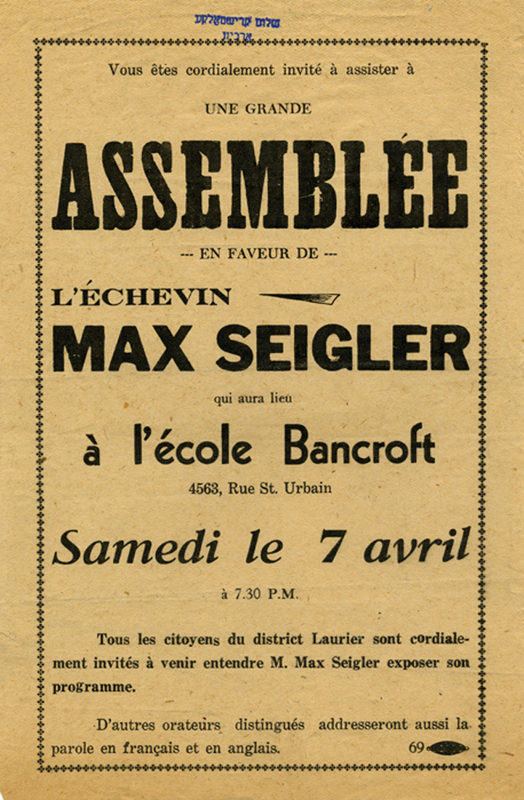 [Campaign for Max Seigler, Laurier District] (between 1940 and 1960). 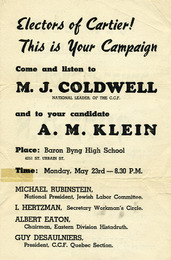 Flyer. 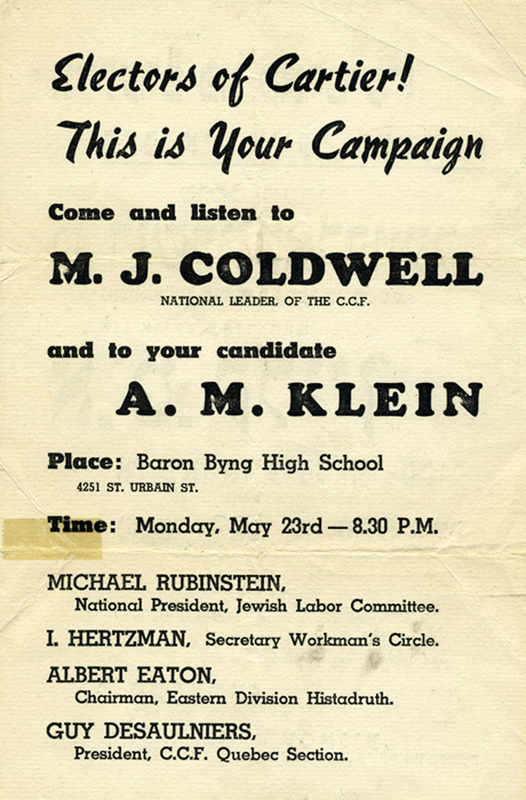 Campaign for A. M. Klein, also including speeches by M.J. Coldwell, M. Rubenstein, I. Hertzman, A. Eaton, G. Desaulniers (1949). Flyer. 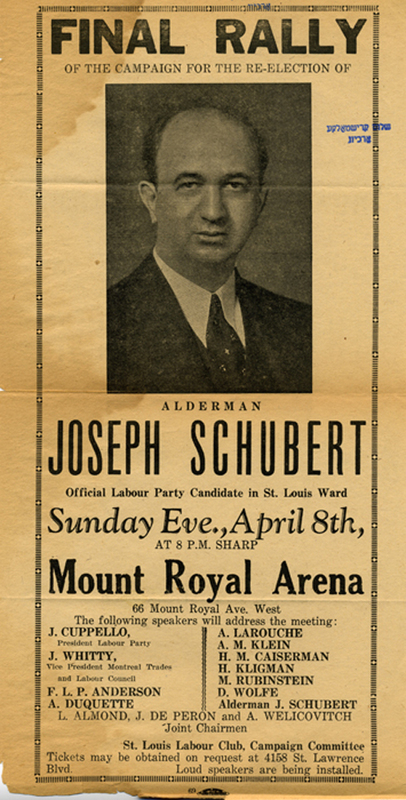 Final rally for the re-election of Alderman Jospeh Schubert. Speakers inlcude A.M. Klein, H.M. Caiserman, J. Cuppello. 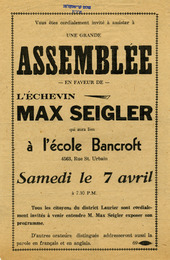 Flyer. 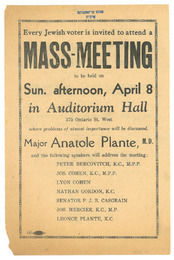 Mass Meeting with speakers Major A. Plante, P. Bercovitch, Jos. Cohen, L. Cohen, N. Gordon, Senator P.J.B. Casgrain, Jos. Mercier, L. Plante (before 1936).